Anti-Bullying Week will take place this year between the 12th and 16th November. This year’s key theme is “Choose Respect”. The theme has been chosen to highlight the fact that bullying is a behaviour choice and that a positive example can be set by choosing to respect each other. 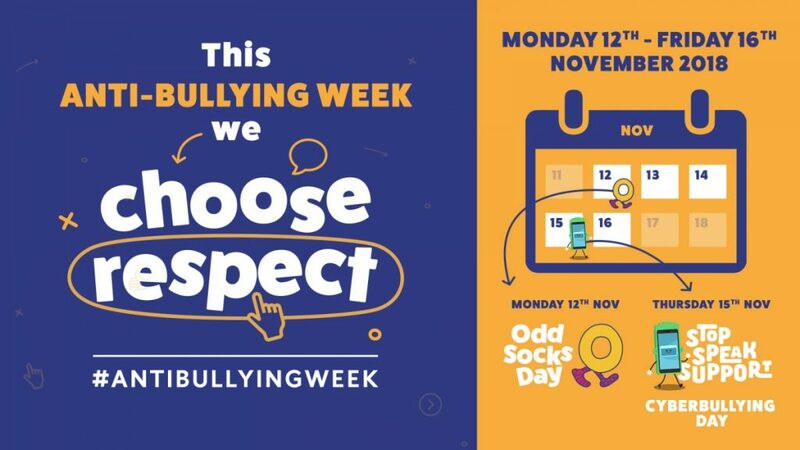 There are two awareness days taking place, starting Odd Socks Day on the 12th and ending with ‘Stop Speak Support’ cyberbullying day on the 15th. The Stop Speak Support day will be Anti-Bullying week’s first Cyberbullying focused day. Cyberbullying continues to be a significant issue for young people today and the issue has received great focus in recent years. The importance of the day is shown by its support from the Royal Foundation and the Royal Cyberbullying Taskforce set up by the Duke of Cambridge. Organised by the Anti-Bullying Alliance, the week raises awareness of bullying and the impact that it can have on all in society, not just children. The Alliance, started in 2002, want to create an environment where people can live, grow, play and learn. They do this by providing support and expertise in relation to all forms of bullying between children and young people.